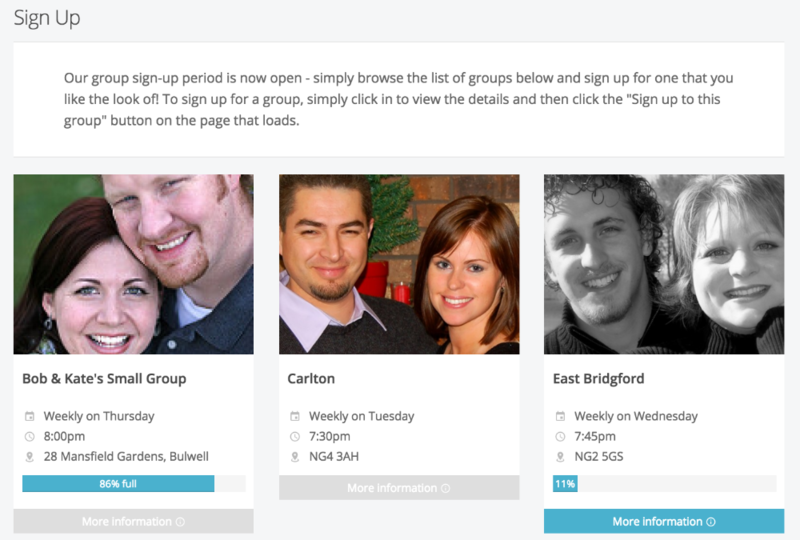 Helping your members to sign up for new groups by letting them do it through My ChurchSuite is easy to do - here's how. This article presumes that My ChurchSuite is already enabled and set up in your account. See how in the related article on "Activating My ChurchSuite" below. 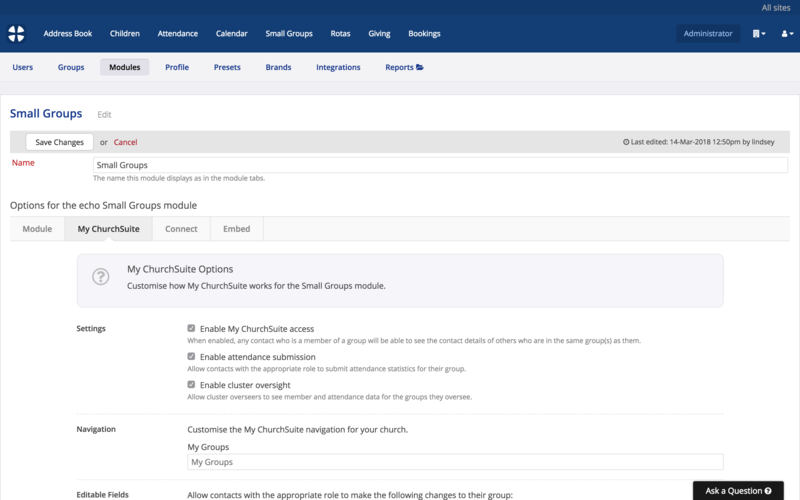 In ChurchSuite, go to "Small Groups" and click the module options button (the cog-wheels in top right corner of the module). To access these settings you will need either Manage module or Administrator permissions. Click on the "My ChurchSuite" tab. In the Settings section, ensure that "Enable My ChurchSuite access" is enabled - without this, the My Groups section will not be displayed for your church members in My ChurchSuite. Optionally 'check' to enable attendance submission and cluster oversight. 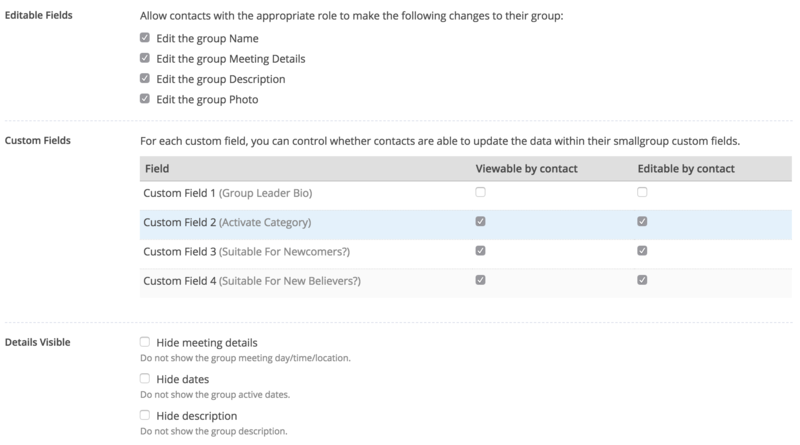 Optionally set the editable fields that contacts with the appropriate small group role(s) can change for their group; and whether any of your small group custom fields are visible in the My Groups section or editable by those whose role(s) permit. Then set whether any of the visible group details should be hidden. 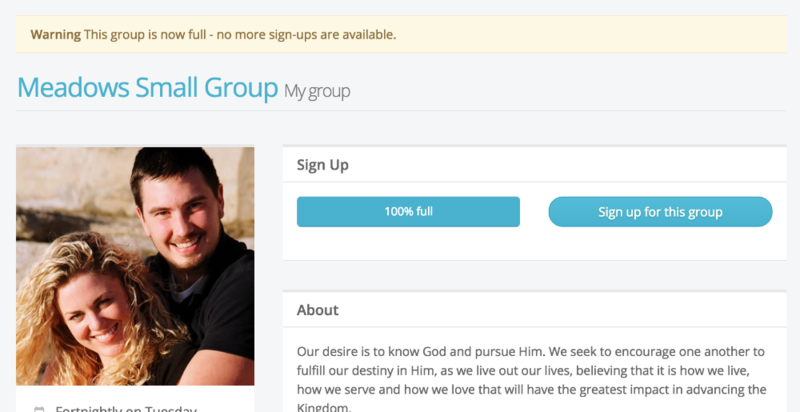 Scroll down the module settings to the section called "Group Sign-Up" and optionally customise the sign-up message that will appear in My ChurchSuite on the My Groups page just above the list of groups that your church members can sign up to. Multi-site churches can also select whether to permit members to sign up to groups from a different site, or just the member's own site. The "Show groups" setting (above) allows you to choose whether 'active' or 'active and future' groups should be displayed. My ChurchSuite will still respect each group's individual group visibility settings, so only those active or future groups set as "Show in My ChurchSuite" will be shown based on this module setting. In this way, you can choose to show some future groups where sign-up hasn't yet begun, but hide others until sign-up begins or the group starts. Note also that the Group Email feature in My Groups will only work when the group is active or during the sign-up period - attempting to send a group email to a future group email address will result in a rejection email coming back. This means future group leaders can only email their future group members once sign up has begun or the group is active. 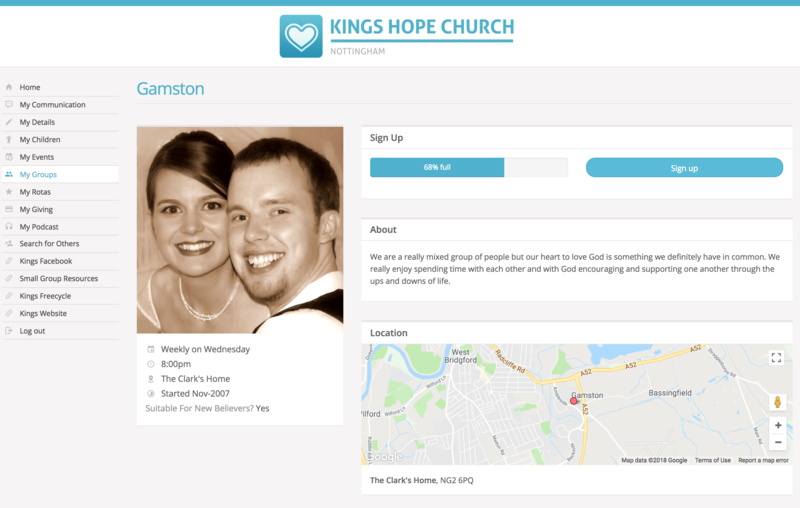 Save your changes before navigating away from the Small Groups > My ChurchSuite settings. Next, you need to make sure that each group that you want people to be able to sign up for has sign-up enabled in the group's settings. To do this, go to "Small Groups" > "Groups" and select each of your groups in turn. Click "Edit Group". Scroll down to the "Visibility" section and select "Show in My ChurchSuite" and also tick to enable "Sign-up through My ChurchSuite" ("Sign up through Group page" will also need to be enabled in order for the other sign-up options to be available). Enabling sign-up means you can add a date range for when sign-up is to be open. Only a start date is required, but you can optionally set a sign-up end date if you wish. If "Show active and future" groups is enabled in the module settings (described above), a future group will still show in My ChurchSuite, even if sign-up has not yet opened. Optionally add a sign-up/group capacity - sign-up will be prevented when the group's capacity is reached. Set when group members should be allowed to see others in their group - either immediately or when sign-up ends. If the sign-up end date is left blank, setting the member list to be visible "after sign-up ends" will mean that the member list will never be visible. Finally, set the default member status of new group members when they sign-up - either 'active' or 'pending'. Pending status group members will need to be approved by the group's leaders before they will be able to view the group's member list. Save the changes to your group before navigating away from the page. Repeat this for each of your sign-up groups. Now, when your church members log into My ChurchSuite and go to the My Groups section, those groups with sign-up enabled will have a "Sign Up" button visible (this is found when clicking through from "More information"). The sign-up button is only visible for active groups within the sign-up period that have capacity remaining. By using the Small Group capacity feature, you can cap the number of sign-ups. Once a group is full, no further sign-ups are permitted; although church members can be manually added to a group in ChurchSuite, allowing you to override the capacity cut-off. Also, those with appropriate small group roles e.g. leaders, if they have group admin functionality enabled, can also add members to their group, in effect overriding the group capacity too.